The economic policies of India since 1991 have been instrumental in creating a storm free climate for ushering rapid growth. However, this growth has not been able to reduce the socio economic disparities which were in existence and which, for the most part, have continued. In the last three decades, these disparities have attracted considerable attention, specifically from the Non-Governmental Organizations (NGOs), developmental scientists, and high net-worth philanthropists and business professionals. Today, with the introduction of CSR under Sec 135 of the Companies Act 2013, companies have moved from charity and philanthropy to empowerment and partnership. This change to stakeholder participation is a welcome change which brings in accountability of the CSR spends and involves planning, implementation and monitoring of progress of the intervention. Corporates should bring in the same rigor & review process in CSR as they would do for any of their corporate projects. The efficacy of CSR spend will ensure adherence to the letter and spirit with which the law was introduced. What should be a company’s CSR focus area? Most companies are grappling with this question. While there is a general guideline on the listed areas in Schedule VII, there is nothing cast in stone on what should be the focus area for corporates? It is seen that corporates try to spread themselves thin and try to do small contributions across all the areas listed in Schedule VII. The 2030 Agenda for Sustainable Development could be a good starting point for corporates. India is a signatory to the UN – 2030 Agenda for Sustainable Development. Sustainable Development Goals (SDG) are concrete quantitative targets and the reality is that government alone cannot ensure the achievement of the Sustainable Development Goals and it would make logical sense for corporates to pitch in. No company can meaningfully contribute to all 17 Sustainable Development Goals. 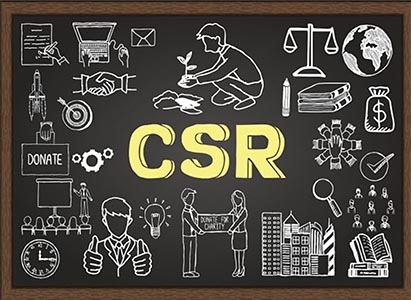 If companies can align their resources and activity towards any one of the goals, it would really be very compelling to actualize the CSR objectives desired. In 2016-17, INR 2042 Cr of CSR money was spent on Education, which is approximately 25% of the total CSR spend by Corporates. On a closer examination of the spend, it can be seen that most of the money was spent on donating school bags and books, building infrastructure and toilets, etc. Clearly, corporates should go beyond supporting tuitions, providing books or building school infrastructure with their CSR funds. It is not enough just to build infrastructure. The government already does that. What we need is to supplement that infrastructure with quality education. Under CSR, in education, corporates can look to support processes, organisations (NGO’s) that have clear learning outcome targets, which are easily measurable. It is better for corporates to collaborate with NGO’s that make interventions in Govt Schools than in setting up parallel educational institutions which is counter productive. The government spend on Education is INR 79685 Cr. In 2017-18, the Govt has allocated money to an “innovation fund” to leverage technology to give quality courses for the secondary education segment in 3,479 educationally-backward blocks. The CSR spend of companies is a fraction of the spend of the Government, hence is very important that this money is spent in a judicious manner and social value is created out of the spend. Creativity is key. Social problems need changes at a systemic level with creative solutions. An example of good creativity by a corporate – this Corporate used Information Communication and Technology (ICT) to address a real time Education concern of low teaching staff and absenteeism of teachers in Government Schools. The Project was implemented in 10 schools on a pilot basis. The infrastructure included setting up an ICT center at DIET (District Institute for Education and Training), developing ICT friendly smart classrooms and Audio Visual (AV) rooms. The curriculum was digitized and teachers of one school could connect with 5 other schools and deliver classes. ICT enabled education has the potential to transform the system of education and also address key issues including poor learning outcomes, high student teacher ratio, dearth of good quality of teachers that can impart quality education. Once experimental pilot projects such as these are successful then the Govt can take a cue in replicating this model in different parts of the country. We need to prepare our future generations to face the challenges of a ‘knowledge economy’ of the digital world. It is imperative to ensure that we skill our children in schools so that there is no ‘digital divide’ that creates a gap between the information rich ‘elite’ and the neglected ‘disadvantaged’ masses.